2017 TUDA Awards Jury | Williamson Williamson Inc.
Last night was a beautiful evening spent at the Palais Royal enjoying the late summer warmth and the lake view while celebrating the winners of this year’s Toronto Urban Design Awards. Betsy spent two days on the jury in June with Elsa Lam, David Anselmi, and Gary McCluskie visiting nearly three dozen projects before narrowing the field to twelve Awards of Excellence and 9 Awards of Merit. Visiting the work is critical to assessing the level of detail and care in the design and construction and seeing how well the spaces are configured and maintained. It was a strong group of entries this year and every team recognized should be thrilled with their achievement. The Jury Report is available here as a PDF and the Jury Statement is below. 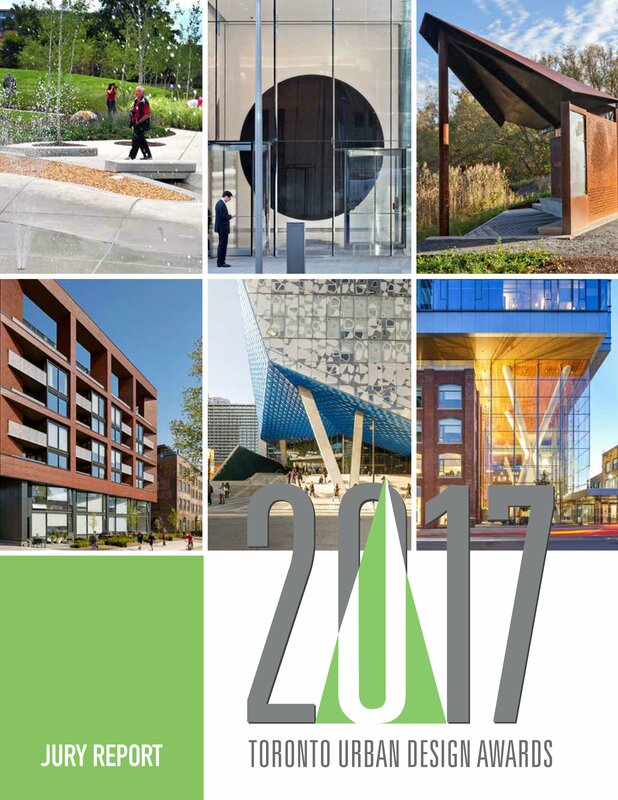 Every two years, the City of Toronto Urban Design Awards program provides an opportunity to assess the progress of the city’s built environment, and to recognize those buildings that strengthen the public realm. The program looks at buildings in their context to identify those that make a positive contribution to the life of the city, and to assess how well they respond to their surroundings. Above all, the jury seeks to identify projects that are unequivocally public—that engage people through their presence in or proximity to the public realm, adding noticeably to the civic experience. These considerations can’t be measured solely through presentation panels and project texts. So, after compiling a shortlist of projects, the jury piles into a mini-van to visit every chosen site as a group. Over the course of two days of touring and deliberations, this year’s jury travelled to the city’s furthest reaches—from City Hall, to Etobicoke, to North York, to Scarborough—to arrive at the present list of award-winning projects. The selected projects share a number of common characteristics. Aside from being exemplary in their contributions to the public realm through siting, programming, or composition, all the winning projects also demonstrate conceptual rigor, fine detailing, and equally fine craftsmanship in their construction. The quality of a project’s detailing and construction is critical in contributing to the experiential quality of the city and raising the bar for public projects. Craftsmanship is exemplified in two projects that received awards of excellence in the Elements category. The public art installation Two Circles and the pavilions at the East Point Bird Sanctuary are each made of a single, carefully manipulated material— ceramic tile and Corten steel, respectively—with results that demonstrate discipline and restraint, and that add to the works’ settings both from afar and up close. The reuse of heritage buildings also requires a degree of craftsmanship, as well as a vision for an existing building’s potential. The jury found this embodied in the Queen Richmond West development, in which a new block is perched atop two heritage warehouses, supported by sculptural columns in a publically accessible atrium—a stunning blend of old and new. As a more traditional adaptive reuse, the revitalized Broadview Hotel shows a commitment to superb workmanship and intelligent programming, giving new life to a long-neglected neighbourhood landmark. A good maintenance regime was also important to the awarded projects, particularly those that involved a public space or landscape component. The jury visited several projects that caught their attention in photos, but in reality proved under-maintained or poorly constructed in the first place. It is critical that there is a commitment to maintenance, whether by the City or private ownership, especially when projects are outside the norm. Forward-thinking design should not be driven by yesterday’s maintenance procedures. On the flip side, projects designed with ease of maintenance in mind stood out: Joel Weeks park, for instance, used a limited palate of easy-to-care for plants, which thrived as a result. Parallels can be seen in architectural projects. For instance, the commercial infill project at 619 Queen West was simply detailed, but included elements such as signage in its scope—keeping urban clutter at bay by intentionally controlling the integrity of the design. Projects may be excellent whether they choose to blend in or stand out from the urban fabric. Branksome Hall’s Athletics and Wellness Centre, for instance, is a relatively discreet presence along Mount Pleasant Road. The smart deployment of its large-volume spaces to achieve this effect is pivotal to its success. On the other hand, a building such as the Ryerson Student Learning Centre is designed a landmark, and strongly announces Ryerson’s presence amongst the hubbub of Yonge Street. A building such as Toronto Public Library’s Scarborough Civic Centre Branch walks a fine line. As a small-scale building, it asserts itself to be seen against the monumental Civic Centre complex, yet ultimately defers to the larger building and allows the Civic Centre to take its rightful place at centre stage. This year’s awards also recognize a number of large public places: notably the West Donlands public realm, the Central Waterfront portion of Queens Quay Boulevard, and the revitalization of Front Street adjoining Union Station. This group of awards gives credit to current efforts to make significant improvements to the public realm as downtown Toronto continues to densify and develop. The West Donlands project is particularly notable for anticipating the future growth of a new neighbourhood, and setting in place a public realm plan of streets, parks, and lanes that will give structure to the area as it continues to take shape. The jury chose to give a special award to Luminato’s use of The Hearn to host its 2016 performing arts festival. This award for Urban Activation recognizes the importance of bringing this massive piece of infrastructure—as well as the Port Lands area that it sits on—into the urban imaginary. Temporary installations, often built for Toronto’s arts festivals, can potentially be seen as proof-of-concept exercises that imply a greater permanent contribution to the public realm, rather than being only one-off art installations. Creative, context-sensitive efforts at all scales—from activating old power plants with performing arts festivals to designing finely crafted infill projects—will continue to be important as Toronto grows towards the future.